Photograph depicts the coastline of Barkley Sound.Rock formations at low tide; white-capped waves crashing against rocks; forested island in background. 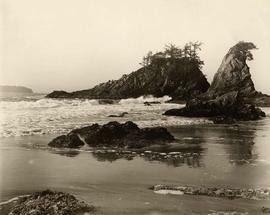 Photograph depicts Barclay Sound, near Bamfield Creek, Vancouver Island, British Columbia.Landscape shows a sand beach with waves washing in over shell-encrusted rocks and sharp, tall rocks topped by craggy trees extending into the ocean. 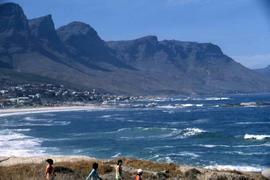 Colour Kodachrome 35mm slide depicts children playing on a beach with a mountain in the background. Colour Kodachrome 35mm slide depicts a beach with a structure in the background. Colour Kodachrome 35mm slide depicts a beach with two people on the sand. Photograph depicts a group of children burying another child in the sand.Written on verso: "Page 6. 76%. Having fun is our business"
Photograph depicts coastal surf.Low lying rocks in low tide in foreground of image; white-capped waves crashing against rocks and sandy shore in foreground; ocean, islands, and horizon in background. Photograph depicts a crowd of people on the beach at Coney Island.Crowd of people, some wearing wool bathing costumes, others in modest morning dress on beach; smaller crowd of people in water; dressing tents and residential skyline in background. Photograph depicts a crowd of people on the beach at Coney Island.Crowd of people, some wearing wool bathing costumes, others in modest morning dress on beach; smaller crowd of people in water; Coney Island boardwalk in background.